In addition to a general tidy-up, you will find the required response is now restricted to 10 characters. That may sound a little mean, but actually 10 is still far too many for a cloze question. 3-5 is ideal. Suppose you want to test whether your students know that the product of a certain chemical reaction is copper sulphate, rather than some other similar compound such as copper sulphide. To eliminate success from random guessing, you want them to type their answer rather than choose from a list. Definitely a case for a cloze question. The first problem is there are two perfectly acceptable ways to spell this in the UK: [copper sulfate] and [copper sulphate]. Could you get round this with fuzzy match? Well, no. 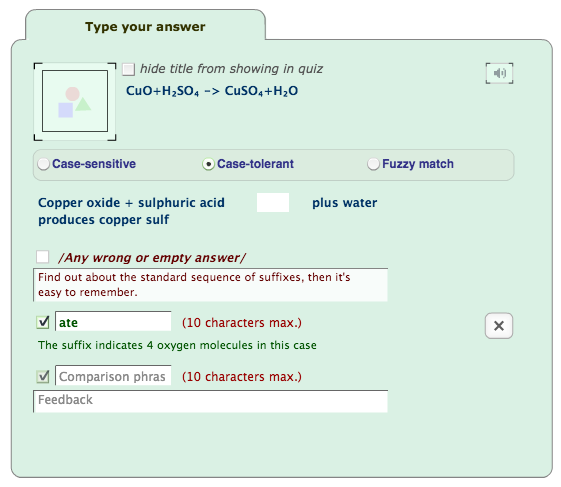 Fuzzy match would also give most of the points for the answer [copper sulfide] which is entirely incorrect in this context. And it gets worse. 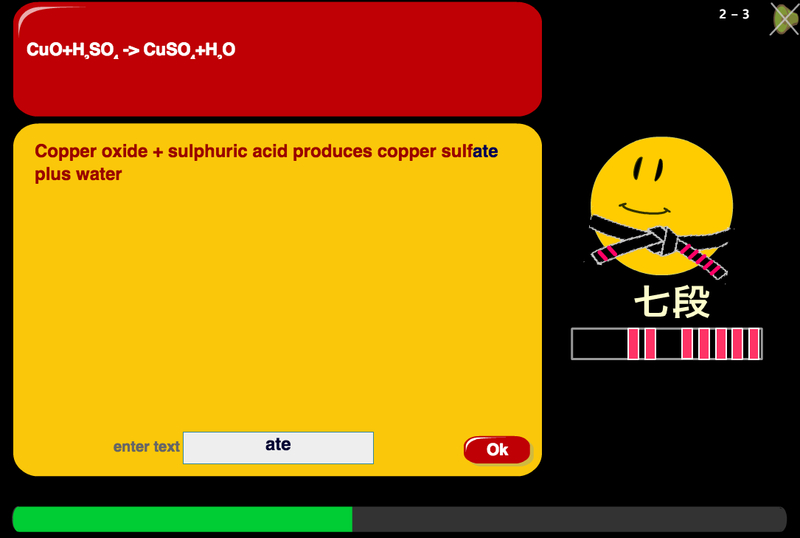 Students might answer [coper sulfate], [copper suflate] or any one of dozens of possible misspellings that would still indicate that they knew the correct suffix was ‘ate’. Trying to enter a list of all possible answers would be exhausting and probably futile. Now we have a valid summative test of just the one thing we want to test. A student who gets this wrong almost certainly does not understand the chemistry involved. A student who gets it right may only have rote-learned the answer, but that’s a challenge for another tutorial. This entry was posted in Authoring, Yacapaca and tagged authoring, best practice, cloze, gap fill, question, suffix, summative. Bookmark the permalink.